For some time now friends have asked me to respond to a certain blog entry by Dr. Richard Carrier, one entitled “The Historicity of Paul the Apostle” (dated June 6, 2015), in which the author expresses himself regarding my book The Fabricated Paul. My response has been delayed due to more pressing work, and also to my natural aversion towards engaging in a confrontation that includes a degree of unpleasantness. Being reminded by some, however, that Carrier’s statements cannot go without rebuttal, I have now acquiesced to the task. From the natural philosophy of the Early Roman Empire to Paul? I was astonished to read Carrier’s statement, “I cannot ascertain his qualifications in the field.” Now, my “field” is the New Testament, and my specialty is Paul. 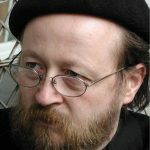 Carrier can be confident that someone whose Ph.D dissertation was on Paul and whose preceptor was a noted New Testament scholar (Walther Schmithals) is at least a little versed in the field and, furthermore, is qualified to have an opinion—more qualified, on the face of it, than is Carrier, whose academic training was not in the New Testament field, much less in Pauline studies, but was in the natural philosophy of the Early Roman Empire. 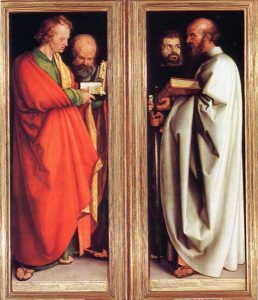 Carrier may think he is writing about Paul, but perhaps it is fitting that the illustration accompanying his post is not of Paul—it is in fact the evangelist Mark from Albrecht Dürer’s 1596 painting “The Four Apostles.” Mixing up Paul and Mark in this way is hardly an exegetical error and should be of little moment, though this artistic faux pas indeed betrays a lack of attention to general information, something that does not bode well for what is required in this endeavor, namely, scrupulous care in dealing with the details of varied Pauline traditions. The thing is, we are dealing here with more than a mere mistake in the selection of illustration. 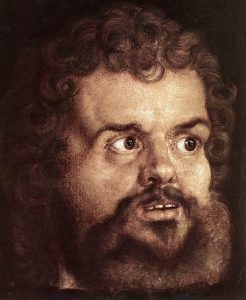 If Carrier—the scholar of natural philosophy in the Early Roman Empire—were as familiar with early Christian history as he claims, he would (or should) know that the traditional depiction of Paul is entirely different from the hirsute head of St. Mark depicted in his blog. Thus, we read in the apocryphal Acts of Paul and Thecla (§3), that Paul was “a man small of stature, with a bald head and crooked legs, in a good state of body, with eyebrows meeting and nose somewhat hooked, full of friendliness.” This is the widely known depiction of Paul propagated by Christianity down through the centuries. But Carrier evidently isn’t aware of the traditional iconography of a bald Paul. So, to his lack of attention to general information (selecting the wrong image), we must now add a lack of familiarity with basic Church tradition regarding Paul. From the outset, then, the knowledgeable reader of Carrier’s post will be necessarily—and altogether correctly—suspicious. It would certainly be helpful to the reader if, according to accepted scholarly practice, Carrier offered a citation or some other evidence supporting this opinion. Presumably he is referring to a short section in The Fabricated Paul (2003 edition: The Falsified Paul, pp. 39–40) entitled “Did Paul Copy from Himself?” In that section, however, I merely offer a general scholarly consensus: “it has been concluded that [2 Thessalonians] originated with use of [1 Thessalonians].” I do not contest that consensus which is amply confirmed and whose basis is also explained in the section (something Carrier seems to have ignored): both letters to the Thessalonians agree in many passages (sometimes verbatim), resulting in the astonishing fact that “there are only nine verses in 2 Thessalonians without parallels in 1 Thessalonians!” From this I concluded that a later hand had reworked 1 Thessalonians (rather than Paul having copied from himself), and I then offered several fairly obvious reasons for this view, namely, why the changes between the two letters were made. Indeed, the case is not unique: the best known example of such wholesale repackaging of a pre-existing letter in Pauline garb is the Epistle to the Laodiceans. It is well known that, as a rule, a forger takes pains to mimic the style from which he is copying. Stylistic borrowings are inevitable, be they extensive or subtle, and sooner or later they must come into consideration. That “self-referencing signatures” occur “only in forgery,” however, is a strawman argument of Carrier’s. I have never made it—nor, to my knowledge, have the scholars I have cited. Multiple parameters must be taken into account before a verdict of (deceptive) forgery vs. (innocent) copying can be made. When such parameters are accessible to the researcher, however, it is possible to confidently conclude that epistles like 2 Thessalonians and Galatians are inauthentic constructs. Given a nuanced approach that relies on evidence collected from multiple parameters, it is naive to suppose that the (“radical”) allegation of inauthenticity can be overturned by recourse to a superficial and vague strawman argument. The vagueness continues in Carrier’s statement immediately following the one we have just considered: “in fact, they [i.e. “self-referencing signatures”] are commonly found on real letters—I’ve seen several examples in papyrological journals.” Now, it may be that Carrier has acquainted himself with a wealth of ancient papyri. He may even examine such documents instead of the newspaper at breakfast. But is it permissible to ask: precisely which “self-referencing signatures” has he in mind here? And is he quite certain that forgery, in those cases, is not possible? Carrier certainly owes his readers answers to such questions—and not merely here, but in the many other places in his writings where an apodictic “absurd” or “ridiculous” peppers his prose and stands in lieu of evidence, reasoning, and proof.